The Cambray Building neared its new foundation on the south side of Superior Street Tuesday morning. Fort Wayne Mayor Tom Henry talks with workers while the Cambray Building moves to its new foundation. Crews carefully moved the old Cambrary Building over its new foundation Tuesday. Officials from the City of Fort Wayne and Allen County joined Bud Hall as the former Baltes-Cambray building was officially moved to its new location along Superior St. Tuesday morning. The Baltes-Cambray Building was constructed in 1895, and was set to become a casualty of demolition in the ongoing riverfront development project. Hall’s Restaurants stepped in to purchase the building in the fall of 2017, paying $2,570 to secure it. The deed was officially granted to Hall’s last January. Bud Hall probably could have just bought new property and built from the ground up. But for him, there’s just something about the way it was built. Hall will use the building as the home of a new Hall’s Restaurant. He reminded residents that this is the first of several phases, and there’s no timetable for a grand opening. But the ideas are already there. “We’ll have a patio on the first floor, an elevated deck on the second floor overlooking the Promenade,” he said. 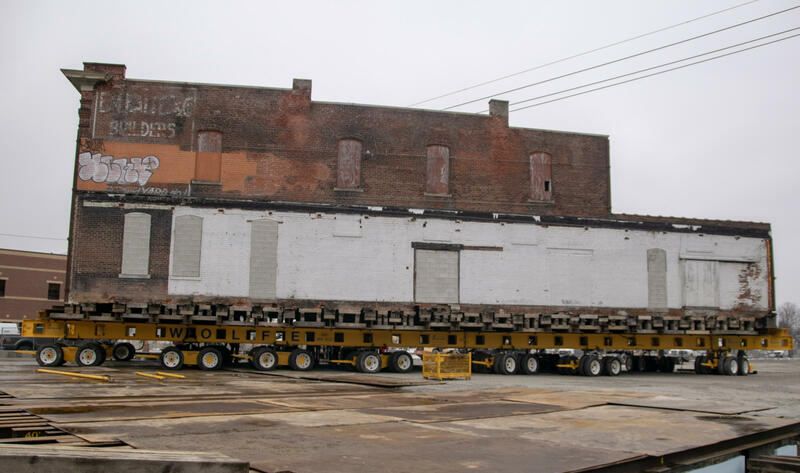 The building was moved on a giant truck with 56 wheels, from its prior location at 312 S Harrison St. to its new home at 177 W Superior St. It was completed in roughly five hours.